People of several different races are having a public event. Two people of one specific race show up to cover the event. Someone at the event says, “We don’t want that race here.” The two race-offenders are escorted out of the event, despite the fact that they had personally done nothing wrong. They were journalists, and were kicked out of the event simply because of their skin color. Now let’s say there was a backlash. The event organizers took some heat for barring one race from the event. You might think the event organizers would apologize, promise sensitivity training, insist the two people were kicked out because of one person’s mistake instead of any discriminatory policy, and claim the entire thing was just a misunderstanding. Or maybe they’d immediately fire/exile/expel/charge whomever kicked people out because of their race. Isn’t that what always happens when an organization does something blatantly racist? In this case, no. 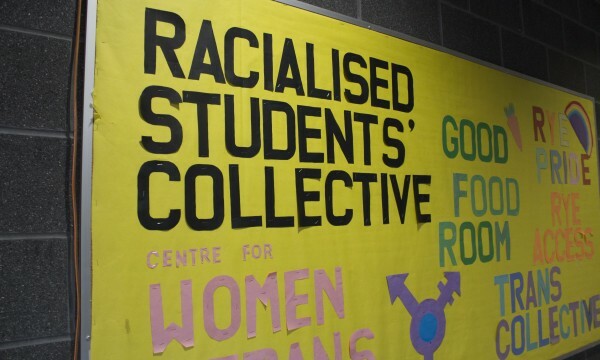 This event was at Canada’s Ryerson University, hosted by the Racialised Students’ Collective (and the mentality displayed by the “Racialised Students” would be at home on any number of American universities). The people kicked out were white journalism students. So no harm, no foul, no widespread outrage. It gets better than that. Shortly after the somehow-not-racist-event, the Huffington Post published an essay from Ryerson journalism student Aeman Ansari titled “Ethnic Minorities Deserve Safe Spaces Without White People”. She also says, “I am a person of colour and a journalist and so there are two conflicting voices inside my head. But in this case one voice, that of a person of colour, is louder and my conscience does not allow me to be impartial. I have to take a side.” This is a sentiment I strongly suspect many journalists with “social justice” indoctrination share. Perhaps that’s why they shy away from any story that might reinforce negative stereotypes about a minority, yet embrace any story that portrays whites as racist. “Hands up don’t shoot”, anyone? As a minority and supposed “person of color” (if I ever actually use that phrase to describe myself, please punch me), I guess I should be thrilled that my fellow coloreds are now free to put white people in their place. I should cheer the Racialised Students and embrace my dark-skinned sister for being courageous enough to accuse – in the Huffington Post, where blatant racial pandering is never welcome (yuk yuk) – all white people of being oppressors. Long live the revolution. Kill whitey. Power to the people. Four hundred years of oppression. Whoop. But I just ain’t feelin’ it. Maybe I wasn’t oppressed enough as a child; I grew up in Texas, “the America of America”, in a mixed white and Hispanic neighborhood. I was around whites all day every day. We played, went to school, and grew into adulthood together. I’m obviously Hispanic, but somehow was never oppressed by whites (or maybe I just didn’t notice). At seventeen I joined the Marines and served with men and women of all colors, but most were white. As a cop I’ve risked my life with and for whites, and whites have risked their lives for me (likewise with blacks, Asians and others). As a soldier in Iraq and Afghanistan I experienced the same thing. Were some whites I knew racist? Of course. So were some blacks. So were some Hispanics. My parents were discriminated against, as were my grandparents. One family story even had the Texas Rangers murdering my great-great-grandfather and his brothers in retaliation for one of Pancho Villa’s raids. If the story is true, I’m pretty sure the Rangers who committed the murders are dead, as are most of the people who discriminated against my parents and grandparents. The country has changed, for the better. I embrace that change. I see Americans of all colors treating one another as equals every day. And I heard of this guy once, who said something like, “Don’t be a dumbass and judge someone just because of what color they are.” That actually applies to whites too, not just supposedly oppressed minorities. And whites shouldn’t be viewed as the world’s only oppressors. Slavery among blacks was so common in Africa it remained legal in Nigeria until 1932, in Ethiopia until 1942, in Niger until 2003 and in Mauritania until 2007; even now a huge portion of Mauritania’s population is still believed to be slaves. Black Africans were heavily involved in capturing and selling slaves, and some historians estimate “… Africans captured and then sold to Europeans around 90% of those who were shipped in the Atlantic slave trade” (http://en.wikipedia.org/wiki/Slavery_in_Africa). Here in America, where our default is “whites were slave owners, blacks were slaves and that’s the end of it”, free blacks owned slaves as far back as 1654. Free black slave owners in Louisiana even requested, and were granted, permission to serve in the Confederate Army (http://www.theroot.com/articles/history/2013/03/black_slave_owners_did_they_exist.html). And Arabs, now automatically considered oppressed, were well-known and enthusiastic slave traders for centuries. Here’s just one example: “Periodic Arab raiding expeditions were sent from Islamic Iberia to ravage the Christian Iberian kingdoms, bringing back booty and slaves. In a raid against Lisbon in 1189, for example, the Almohad caliph, Abu Yusuf Yaqub al-Mansur, took 3,000 female and child captives, while his governor of Córdoba, in a subsequent attack upon Silves in 1191, took 3,000 Christian slaves” (http://en.wikipedia.org/wiki/Arab_slave_trade). With this historical context, how does anyone arrive at the “white = oppressor, nonwhite = victim” conclusion so beloved by Aeman Ansari and Ryerson’s Racialised Students? Maybe I’m breaking the inviolable Oppressed Minority Code of Silence by saying this, but every race has its share of historical horrors. White people shouldn’t defined by past slave ownership any more than African blacks should be. I’d also like to point out an inconvenient fact: If all white people are evil because of slavery, then all white Americans are heroes for ending it. Maybe I’d be the only person on the typical University campus who’d know this, but in America we actually fought a really bad war to end slavery. Over 350,000 white Americans died fighting to end slavery. White Americans burned white American cities to the ground to end slavery. White Americans completely destroyed other white Americans’ ways of life and forced them to abandon slavery. American slaves weren’t powerful enough to rise up and free themselves; white people freed them. Why do whites seem to get all the blame for historical oppression, but none of the credit for fighting it? Yes, I realize it’s pathetically stupid to credit all whites for the actions of those who fought to end slavery. And it’s just as stupid to condemn all whites for the actions of those long dead. I’m not saying all white people are great; plenty are absolutely scumbag (I’ve arrested a LOT), and many are racist. But those people should be judged on their own merits. Am I wrong to view whites, or anyone else for that matter, as individuals who should be judged as individuals? When I was in Kosovo I had a conversation with a local about her ethnic enemies. “The adults commit crimes against us. The old ones used to, and the young ones will someday. So they should all be killed, from one until the end.” It was a stupid, destructive mindset that always, always, does horrible damage to those who hold it. In modern America, and Canada, everyone should reject the notion that all people of any race are the same. Or that we need to keep any race out of our “safe spaces”. 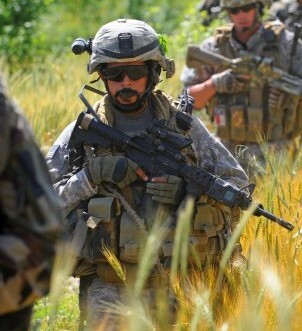 Oddly enough, this is one thing I loved about being in combat; under fire, you are who you are. Nobody cares about race. All that matters is whether or not you can do your job and cover your brothers’ and sisters’ backs. On its website, the Racialised Students’ Collective says it “…opposes all forms of racism.” Then it excludes students for being white. I’m sure the Racialised Students don’t see the irony in that. Aeman Ansari, I’m sure, tirelessly campaigns against racism. Then she supports keeping white students away from minorities, because a white person’s mere presence allegedly makes them unsafe. I’m sure she sees no irony. The Huffington Post published Ansari’s essay praising racism against whites, then added a slideshow to the page showing “9 people who think casual racism is okay.” But they didn’t add Ansari or the Racialised Students to the slideshow. The Huffington Post probably doesn’t see the irony either. This. Isn’t it what MLK wanted? “person of color” (if I ever actually use that phrase to describe myself, please punch me), I would but then I would be oppressing you! Great post Chris and (again) some great insight into what’s going in the world. When confronted on this hypocrisy, they will redefine the term racism to mean systematic oppression against marginalized minorities by people of privilege. A white person, they say, can be a victim of racial prejudice but not racism because whites are still systematically favored and privileged. A ridiculous defense, easily and properly countered by attacking them for being prejudiced (rather than racist) – of which they are indefensibly guilty even in their own perverted interpretation of social justice. I’ve asked this before: do the people of Benin and others whose ancestors profited from selling their fellow Africans to European slave traders owe reparations to African-Americans as well? Does the United Kingdom owe reparations to African-Americans, as most of the American slave trade occurred under British rule? Does the Chickasaw tribe owe reparations from its casino income for the slaves it once owned? Or perhaps do African-Americans, who are privileged to be born into a first world country, owe reparations to Africans who are not blessed with that privilege? I could probably fill a book with this if I tried to. Great observations Chris. I have owned African Basenjis since 1966 and began reading and collecting literature on African history as part of a desire to appreciate the land & people related to the dogs. My kid self was astonished to find out the extent of slavery within Africa and that the human trafficking trade was a common part of the economy (let’s face it – it still is, the world over). I became a psychotherapist with a trauma specialty and it is undeniably evident that since we as a species emerged from the primordial ooze we have been indulging in torture + exploitation because we want to and because we can. Racism is just one card in the exploitation deck and everybody’s dealt it. It’s whether you choose to play it or not. Owning slaves has a long history all over the world. Peasants/serfs used to be virtually owned by the nobility and slavery (or death) was what happened when you lost a “war”. Some societies (e.g. Greek & Roman) had protocols to allow slaves to earn freedom; others did not. When mechanical energy replaces human & animal power, slavery (mostly) becomes uneconomical, aside from pure ego boost (e.g. Saudi royalty with their servants). One minor point. The 350,000 white people who died to end slavery are only the unknown dead buried in Arlington National Cemetery ( Robert E. Lee’s former plantation). The actual dead numbered almost twice as many. 350,000 white people did not die to end slavery; any more than 250,000 soldiers died to save it. The 350,000 died to save the Union; the abolition of slavery was an unintended result of the war, not its cause. You may delete this post. I’ve a decimal place off. This is my new favorite blog. How refreshing it is to read someone who isn’t afraid to be who they are and say what they mean. Even if it turns out I don’t always agree with you, this is a refreshing change of pace from other social media sites, where members are very much like the university students. It’s nice to get a different perspective. And thank you for your service. In a funny way, the motives for these groups is very similar to the Stolen Valor idiots- a desire to gain unmerited favor (sympathy, admiration, financial gain, ect) by identifying with groups that actually deserve it. Ever notice how the demands for “safe spaces” are usually made by upper & middle class college types? I remember at basic training the drill sergeants assigning battle buddies across racial lines because we were “all Army green.” There were capable troops across the color spectrum, just as each race had its share of blue falcons I wouldn’t want in the foxhole next to me. Same goes for gender (although I’m sure it will dismay the uber-feminists to learn that they didn’t put males and females together as battle buddies). One of my most painful moments as a teacher was when one of my Hispanic students accused me of playing racial favorites because I told her that she didn’t meet the dress code. When random kids in the hall pull that crap I just tell them that I’m an “equal opportunity jerk” and brush it off, but this one had been in my class all year and knew me better than that. I can only hope the response I gave made her rethink the the whole “woe is me, I’m a repressed minority” crap. As any child of the Sixties would know, discriminating for Equality is like f***ing for Chastity. Once again, I am a fan of your blog for the frankness and openness with which you write. I think one of the reasons why issues like this still occur is because people will always make decisions about how things are based on their own experiences. You may not have ever felt “oppressed” and that influences how you will see the world. I do not believe that I was oppressed either. But I have met several racist in my life. I got jumped by a group of white kids when I was growing up, and they made it very clear to me that it was because I was black. I’ve been called the n-word multiple times, once by a LEO. I can literally list several times where I have experienced overt racism and every single time it was from a white person. I grew up in a racially mixed area. I understand that people have to be judged on their own merit. Some people don’t because they haven’t grown up in a racially mixed environment or just because of how they were raised. They’ve only seen what’s on TV, what the media shows, or have had a negative interaction with a person who has been granted power through some organization whether it be, government or a business, or just a person that they perceived to have power. Education is key, and not just in a classroom, but out in the world. I also think tolerance is necessary. No one is going to have the same life experience. A white kid where I grew up would not have the same experience growing up there that I did. That’s just how things go. Also, I don’t ever want to be called a person of color. Chris, are you going to write more anymore “what police work is really like” short stories? I long for the day when people realize just how insignificant race is when it comes to the measure of a person. Instead, when I have stated that I don’t care about race, I refuse to treat anyone differently based upon their race, and that I judge people by their actions and words rather than something as insignificant as race. I am told that I should check my privilege for having such a racist attitude. You don’t “know” this because it isn’t true. They died to save the union, not to end slavery.Thousands of white Southerners, many from the Confederate States, fought for the Union. They certainly did not fight to abolish slavery. he Emancipation Proclamation was not even drafted until a year and a half into the war. The abolition of Slavery was a result of the war, not its cause. You might as well argue that “350,000 died” to burn Atlanta. Your facts are mostly right, but could use a little more understanding. The South’s secession from the union had been building for some time, but was finally sparked off by the pending election of the first President from a, then still fairly new, single-issue abolitionist political party (That would be Abraham Lincoln, and the Republican party). The secession was all about slavery and the Southern state’s belief that Abraham Lincoln would abolish the institution. So yes, the Northern soldiers were fighting to “Save the Union”, and the South was fighting for “States Rights”, but the reason behind it all had everything to do with the institution of Slavery. Funny thing is. Lincoln initially turned the Republican party down when they asked him to run for president on their ticket. He believed (rightly so) that the President alone did not have the power to end slavery, and that it would require an act from congress to do so. It wasn’t until the Republican party officials agreed that they didn’t expect him to abolish slavery by Presidential Fiat that he finally agreed to run. Even when Lincoln signed the Emancipation Proclamation, he is said to have commented to a friend that he didn’t believe it had any legal power, but signed it anyway because it was bound to have an effect on the war effort. BTW, this isn’t to say that Lincoln wasn’t opposed to slavery. His opposition to slavery is well known. He just knew and accepted the limitations of the presidential office. So, did the average northern soldier have an understanding of the geopolitical ramifications of the civil war? Likely some did and some didn’t. However, they were fighting for the union, and the union was moving inexorably towards the end of slavery, which the South was trying to avoid by seceding. So in effect, that is exactly what they were doing. Excellent article. The Emancipation Proclamation was partly intended to bolster support for the Union cause and increase volunteerism, which it accomplished. So it can be said that a large number of people, particularly northern black Americans, did fight to end slavery. But, from a northern perspective, the motivation of the struggle was overwhelmingly national reunification. So both sides to this debate are valid. A point that gets lost in conversations about race. Most African-Americans are the descendants of slave owning whites. It’s convenient for many of them to deny their white slave owning ancestors, but the fact is, it’s their ancestors who owned slaves and they should pay themselves, or each other, reparations. “Not until the Spanish conquered Mexico,” he said. He still looked confused. People just don’t want to believe that the blood of the so called “oppressors” runs in their own veins. But they are the direct descendants of those oppressors.